Very proud to be interviewed for Pregnantish - a quality magazine exploring issues and experiences of infertility. I think this article has some pretty unique points. Read here. Read my latest mailer for info on the latest! Check it out! Screening Sept 26 of Vegas Baby in Toronto! Click here for more info. 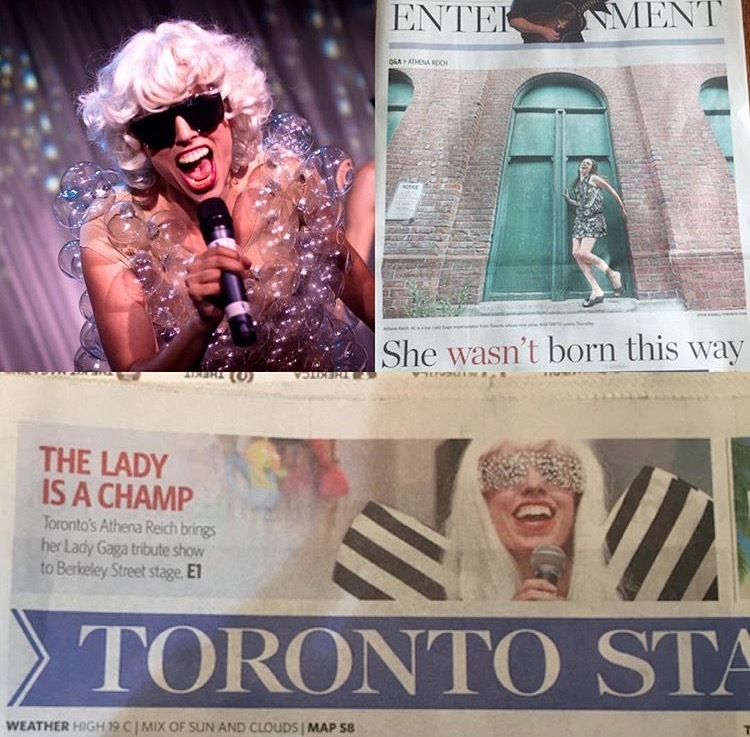 Front page of the Star and front page of the Entertainment section!! Wow! Click here to read! Click to read the full mailer! Click here to read the latest mailer! Big thanks to Tapley Entertainment for booking us, to my dancers Katarina Lott and Carole Biers, and to the amazing Museum who hosted us! Can't wait till our next show there! What a blast!! In addition to being on Amazon, iTunes and more, Vegas Baby is now on Netflix, world wide! Watch it here! VEGAS BABY hits Netflix July 4th! Please watch my favorite deleted scene.. VEGAS BABY aired on PBS last night and hits Netflix July 4th. It's also available on iTunes, Amazon (blue ray & special deleted scenes), YouTube Movies & more. Tickets on sale now for August 2017 in Toronto! She's showed us her "P-P-Poker Face," and now Lady Gaga's ready to share something a lot more intimate and avant-garde with her biggest fans: her real-life p-p-pregnancy! Acclaimed tribute artist Athena Reich stars as an expecting Lady Gaga in #ARTBIRTH, a hilarious evening of art, pop and comedy that combines vaudevillian comedy with ARTPOPoutrageousness. The show features a very preggers Lady Gaga who's decided to give birth in front of her most devoted fans as "the ultimate performance art piece." Star Athena Reich is an award-winning comic actress who's received acclaim from Lady Gaga's "Little Monsters" -- and even Gaga herself. Come see Gaga's baby being "Born This Way" in this show full of dancing, singing and afterbirth. Coming to Toronto to the Berkeley Street Theatre August 2017. I had a fabulous time in the studio making a new voice over reel. Thanks to my coach John Stocker (voice over legend) and the incredibly talented Dave Boire of DB Audio, I now have an awesome new commercial voice over reel! Listen here! And new headshots by Hayley Andoff! I'm not someone who goes 'gaga' for celebrities. Having been in this business since I was a kid, I know how how crucial luck and timing are to a career. Having said that, it is always fascinating to work with someone who has tons of experience. When it came time for our 'moment', Sandra arrived and said, "Athena! I always wished my name was Athena!". I had to make our little crowd laugh in the moment before our scene, so I told stories about my baby having colic while I was alone in New York as a single mom. "Oh my god!" she said afterwards, "I thought you made that up!". Charming and empathetic, Sandra won me over immediately. However, it's not just charm. It's also smart to quickly connect with your scene partner right before you shoot. That's just good acting. Counter to that, I was recently at an audition where a fellow actor was listing off his accomplishments, and quizzing me for mine, in a passive aggressive manner. It's such a clear example of how there is no need to be mean or demeaning in order to succeed. Friendliness, humor, and an open heart can get you even further. Very proud that my story is published on this amazing website and upcoming e-book. Enjoy! Click here to read. Vegas Baby (formerly titled “haveababy”) has had an amazing run on the festival circuit and gained a ton of important press. It has a new trailer and is coming to a theater near you! Upcoming screenings include NYC (March 28), Cleveland, Las Vegas, Bay Area, LA — the list goes on, and they are adding cities every day! If you are a small community group, don't be intimidated! Please reach out as they are open to all types of screenings, big and small. The mission of this grassroots screening campaign -- with the help of Executive Producer Morgan Spurlock (Supersize Me, CNN’s Inside Man) and RESOLVE: The National Infertility Association -- is to raise awareness about infertility by starting a national conversation around this often misunderstood issue through the powerful medium of film (with a dose of good humor injected by yours truly). Email amy@vegasbabyfilm.com with any questions about how you can be a part of this cinema-on-demand campaign! New episode, record label and more! If you aren't on the monthly mailer, please click here to subscribe. And/or click the pic below to read the latest mailer! Athena & Phoenix reflect on Turning 1.